For anyone who hasn't seen the new Bond documentary EVERYTHING OR NOTHING, there are some great talking head moments with Dalton. Even twenty-some years removed from the role, he conveys a deep understanding and intense passion for this character, which is more than can be said about some of the other Bond actors. Thanks for answering, I was just trying to understand your views better. I didn't think you were trolling. I just find tickets sold or box office to be a curious way to measure success or quality. Yeah, just like Quantum of Solace is a generic, modern action film, so was LTK a very typical 1980s action film. Some dude named Bond. You think Dalton NAILED the role, got it chief. I think he was a good Bond, who I admit my opinion of him might be higher had he done more films and I had more material of him to witness. At the end of the day though, he didn't and I don't particularly like (as far as Bond films rank) Lethal W..I mean LTK. Edited by 00 Brosnan, 26 November 2012 - 12:37 AM. I want to see this documentary! And I only put him behind Connery just because Connery is the classic Bond, but Dalton is definitely high up there! ... especially because License to Kill is regarded as one of the legendary Bonds. Ehh, I don't know about that. That's my opinion when I say that about License to Kill. I think it's legendary because it is one of the first James Bond films to really explore Jame's emotional side. That's why I regarded it as "legendary" however, that's my opinion. Ah, ok. I was perplexed as to who regarded it as a legendary Bond film. I admit it's grown on me over the years, but not legendary status. My opinion of course. Dalton films are 21st and 23rd in ticket sales I believe. That is just plain horrible. You would think if the films had good word of mouth they would have better ticket sales I suppose. Now why those movies didn't have good word-of-mouth I can't be sure. Seems like some blame should lie on Dalton. If Dalton films are so low in ticket sales ranking, it's because global movie theater attendance was at a bottom low in the late 1980s. But in fact "The living daylights" ended 4th in the world-wide box-office of 1987 with a share of total ticket sales of the year of 5%. This is exactly what "Casino Royale" did in 2006. People tend to rewrite history by calling Dalton a failure because "Licence to kill" underperformed in the US. But the truth is that "Daylights" was a massive hit in its time. And I remember the only time I saw audience applaud at the end of a Bond movie was in 1987 at the end of TLD. That must say something. Massive hit? I don't remember that. Found this on-line. I think it's a US site so domestic is the US audience - worldwide TLD did do better than the two or three that preceded it. Whether or not is was a massive hit I'll let others with the numbers for other films debate, but I do remember hearing at the time that TLD "arrested the downward trend" that the series was on. Those LTK numbers are pretty glaring and the point I was trying to get across. Edited by 00Hockey Mask, 27 November 2012 - 12:51 AM. I just don't think ticket numbers are a very good indicator of quality. I like Dalton because I think he's an excellent actor, and I enjoy both of his Bond films. The Living Daylights has always been one of my favorites. The ticket sales are meaningless to me because I saw his films long after the fact and I never cared to look up how many tickets they sold. The first time I saw them was when you posted the extensive (and interesting, I might add!) list in the Skyfall Box Office thread. In other words, ticket sales are the least likely thing to influence my opinion/preference. Like I said before, pop acts like Justin Bieber and boy bands like One Direction sell millions of albums, but are the sales a true indicator of good music? I'd say no. Movies, music, and the vast majority of arts and entertainment is very subjective. Different strokes for different folks. Just because Dalton's tickets were low doesn't mean he's a bad Bond. It's like when films become "cult classics" upon being rediscovered. I'm of the belief Dalton was ahead of his time. Daniel Craig 20 years earlier. Dalton was Craig for the post-Roger Moore era. Alas, audiences did not embrace him the way Craig has been embraced. Dalton was a Bond ahead of his time. And his time still hasn't come yet. That's your opinion. 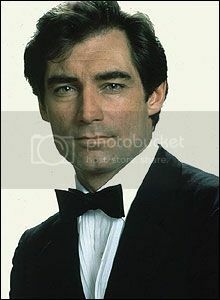 lol this thread is for people who like Timothy Dalton!! That is more than fair. Enjoy. I mean I am not trying to be mean, I am just stating the reason why I created this thread. You can post on it if you want you have the right to your own opinion and I will respect that! Yawn, Dalton tried to act Bond you have to be bond...too stiff like most of his performances.. audiences didnt embrace him and the producers didnt know what to do with him. I wish he do few more Bond movies if the Franchise did delay. I was glad he replaced Roger Moore as 007. But you know when it delayed age caught up with him. But I sure fit the role. Before this I wish he was the fifth Doctor in Dr.Who replacing Tom Baker then leaves Dr.Who in 1985 for James Bond role & it know 007 who. Like Roger Moore Saint 007. Altough Sir Roger was my first Bond and I enjoyed his films tremendously, after AVTAK I was ready for a new Bond actor. Oh, those wonderful articles in magazines offering possible successors. Lewis Collins... John James... Oliver... ah, I don´t even remember his last name. And then Timothy Dalton was cast. I only knew him from FLASH GORDON and was not quite convinced that Prince Arbor would cut it as Bond. But from the first scene onwards, THE LIVING DAYLIGHTS was a total delight for me. I enjoyed the film absolutely and knew: Dalton is my new favorite Bond. After Moore and Connery. Then LICENCE TO KILL was released. In that summer I was starting a new chapter in my life, preparing for university. And the cinemas were dominated by BATMAN, LETHAL WEAPON 2, DEAD POETS SOCIETY and, of course, INDIANA JONES AND THE LAST CRUSADE. Oh, a new Bond movie was in there, too. But the reviews were dismissing it. Too dark, too gruesome. Nevertheless I needed to see every new Bond film. And I watched it... and I liked it... but I did not love it. In fact, I thought: well, 007 is yesterday´s news. Despite the tanker chase the action sequences just seemed not that spectacular and the jokes just weren´t there. I really believe that Dalton only had one problem: bad timing. He came when a huge cycle of 007 success was at its end. And people just were not ready for the kind of down-to-earth, gritty spy action. They were hungry for more spectacle and pure entertainment excess. Hence, Dalton got buried under all those prejudices and childish expectations. He never was a failure as Bond. It was the audience´s failure to recognize his brilliance. Does that mean that everybody has to like his portrayal as Bond? Of course, not. But those who find him stiif obviously just have a very different view of what Bond should be like. Put against Brosnan´s or Moore´s Bond, Dalton´s Bond is definitely more tense, less funny. But, hey, that´s exactly what he wanted (and needed) to be! Put against Craig´s Bond, Dalton´s Bond is the more conventionally handsome, more gentleman-like. Put against Connery´s and Lazenby´s Bond, Dalton´s Bond is less interested in scoring with the ladies and less relaxed in his job. Dalton has created a Bond unlike any other actor. And his two films remain interesting, entertaining and essential to the canon. Not in the US but internationally it definitely was a huge success. It made 50% more than "A view to a kill" and was the first Bond to outgross "Moonraker", ending 2nd of 1987 outside US. Do you think that the producers would have take the risk to do a movie as bold and different as "Licence to kill" if "Daylights" hadn't been such a hit. They chose to go a step forward in the direction taken by TLD because the movie was very well received. Of course, the risk didn't pay off but I'm glad they took it because LTK is such a unique movie. I could have written that. In fact I wonder why I didn't? Anyway, thanks for saving me the trouble. Very well said and I agree. I mean if you watch License to Kill now it's nothing compared to what action movies are doing now. I think Timothy Dalton was at the wrong place at the wrong time and I think he deserves a lot more recognition for his portrayal as James Bond hence why I created the thread. For me, Dalton and Moore are my faves. Dalton just looks badass and Moore is hilarious. A privilege to watch them. GoldenEye would have been the perfect third film for Dalton. I think so too! I can imagine him being in it. He'd probably do that beach scene better than Pierce. Pierce tries too hard when it comes to emotional scenes. Be great to see him match wits with Sean Bean. The final fight scene would have been a lot better. I don't think that Sean Bean would have been cast in the part of Trevelyan if Dalton had been retained for the role. I think that they definitely would have gone for someone older who could have been a contemporary of Dalton's Bond, which Bean couldn't have been given the 15 year gap between them. Anthony Hopkins was one of the names mentioned for the part had Dalton been brought back for the role, if I remember correctly.